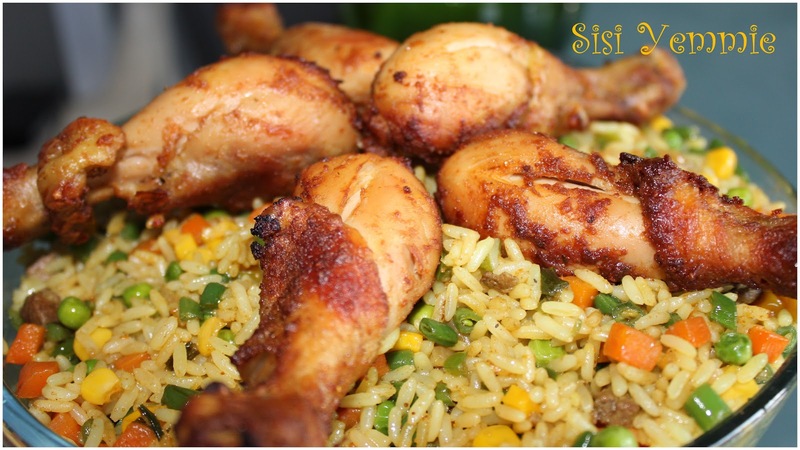 My mummy taught me this one: Most of my friends can testify to this fried rice...this is the rice I can cook with my eyes shut doing the Michael Jackson slide...wooohooo! *grabs ahem* Seriously my people, if I cook this rice for my in-laws bride price musto increase, another at least, 25kobo musto join! This one i'm hailing myself, biko if you've got a different way you make yours let me know oh! I parboil the rice slightly, add the stock/broth, add curry, thyme, knorr cube, salt and blended dry pepper. This pepper is optional, I just don't like rice without pepper. I also add little amount of water and mix the contents of the pot with the omorogun aka o'turneba aka wooden ladle. I always use fresh vegetables because they are so crunchy when you cook with them instead of the processed ones that just become limp in the fry pan. I chop the vegetables. This is the most annoying part for me. I have a history of OCD with chopping the carrots, they must be perfectly 'cubed'! If I have someone helping me, I give them everything else to chop except the carrot. I also make sure I scrape the carrot (the kanda) so that its clean and the colour pops! If I've got chicken or beef I usually fry it so that I use the same oil to fry the vegetables. In the hot wok/fry pan start by frying onions and the spring onion, add a bit of knorr to the onions so that it tastes sweet. Add the liver, allow to fry for about a minute, add the green pepper. Keep frying and stirring. Add some salt, bit of curry, and knorr. Keep frying. Add the carrot and then the green beans. Stir. 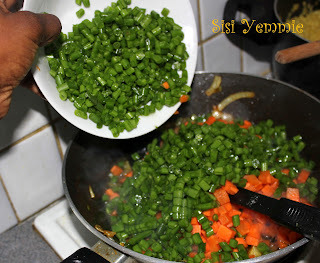 Add the sweet corn, peas and keep frying till its cooked. At this stage I add king prawns if I've got any. 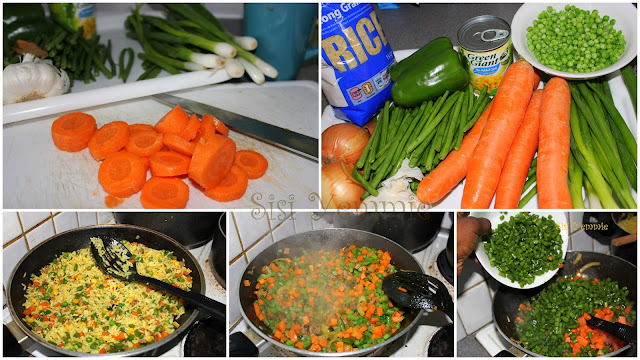 Pour this mixture in a separate pot and start frying your vegetables and cooked rice in batches/portions! This way the rice doesn't stick together, the ingredients go round, and you fry well enough to avoid it getting sour quickly if you're going to store it! I usually fry about two spoons of the vegetable mixture and maybe 3 spoons of rice. Just mix it the way you like, mix in the pan and while doing that you can taste if the seasoning is enough, if it isn't you can add more and then fry.. I like this method because the ingredients will always go round. 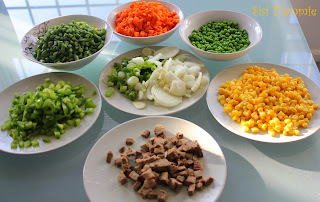 Unlike all those fried rice they serve at some 9ja weddings where its 2 carrots and 1 peas per plate. PS. When I say fry, I don't mean deep fry oh!!! Just mix the vegies and rice together. As always, if you try this recipe and you like it, come back and testify! OH YES!!!! this is the exact method I use, you got it 100%. Pls for those who just parboil the rice like that, take note o! you parboil with your stock water...rice must have taste before the vegetables come in. Wellluuuu done Sisi Birmingham!! lol! looks yummy! thank God for frozen mixed veg..that is what i use to make my fried rice as I don't have time to be cutting up vegetables...and it still comes out on point. I have to say I havent got much patience so I fry the ingredients and mix in the parboiled rice all in one go. Well done! That plate of rice makes me want to cook fried rice today. I will surely do that. Looks so yummy. My first time on this blog. Quick question? Do you parboil the rice until its almost soft? Cos I'm assuming it wud still be hard after all the frying? I parboil the rice after cooking it for 3 minutes then I cook the rice with the stock, and curry and seasoning till its almost soft. Great blog!!! You've got me sooooo hungry! YUMMY! Mehn I should try this! You really are funny. I couldn't help but laugh when I read the Michael Jackson line. Nice work on the rice, it looks tasty. Send it to my blog. Wow! Really nice. Just bookmarked this page to try d recipe later. When you said king prawns, did you mean fresh or dried ones? I like the method, i know this method and it has never failed me. But reading your description is just funny. You make one wanna steal straight from the internet. I tried this today and it was amazing! Thank you so much for sharing this method, my fried rice will no longer come out a mess. hello sis ,i actually came across this in 2014 and i made my first delicious fried rice in Jan, 2015. It came out so nice. Mehn Sisi..you are the real mvp!! I tried this and its finished already..tasted so good. Mehn Sisi..you are the real mvp!! I tried this and its finished already..tasted so good. Ive been cooking fried rice but this one came out differently.. Mumcy n sis went to church so i called to let them know not to branch @ any fast food say food don dey oo. Mehn, come and see mumcy praying for me when she finished eating..Apparently they were starving badly.. Lol. VIDEO: Look of the Day!! !